3rd Place — Logan Storley (Minnesota) dec. Robert Kokesh (Nebraska) 3-1 tb — The Gopher scored the deciding points off a reversal in the first phase of the tiebreaker, then rode out his long-time friend from their native South Dakota for the win; avenging last year’s third-place bout won by the Husker. 5th Place — Matt Brown (Penn St.) dec. Michael Evans (Iowa), 6-3 — The Nittany Lion avenged his quarterfinal loss to the Hawkeye by scoring two takedowns in the first period. 7th Place — Tyler Wilps (Pittsburgh) dec. Bryce Hammond (CSU Bakersfield), 4-2 — After giving up first-period takedown to Hammond, Wilps rallied with three escapes and a stalling point against the Roadrunner. No. 1 Chris Perry (Oklahoma State) dec. No. 4 Mike Evans (Iowa), 3-2 tb — The Cowboy forced overtime when — despite losing 2-1 in the third period — rode out the Hawkeye in regulation to earn a riding time point. Once in OT, Perry first round out Evans, then escaped in the tiebreaker phase. After the victory, Perry threw his ankle bands in the air, flexed to the OSU crowd, pointed at the Iowa corner, put his pistols his corner, held up 4 fingers in the air and pointed that Oklahoma State have four finalists Saturday night. No. 2 Andrew Howe (Oklahoma) dec. No. 6 Logan Storley (Minnesota), 6-2 — The Sooner scored both of his takedowns in the first period, then added a riding time point for the victory. No. 1 Chris Perry (Oklahoma State) dec. No. 9 Elliott Riddick (Lehigh), 4-0 — The Cowboy scored all of his points in the second period — off an escape and takedown with 1:10 in the second frame — before adding a 1:06 riding time advantage. Riddick chose neutral in the third period but could not score. No. 4. Mike Evans (Iowa) dec. No. 5 Matt Brown (Penn State), 5-4 tb — The Hawkeye clinched the victory on an escape off a granby roll 15 seconds left in the final tiebreaker. Brown scored a takedown off a double 11 seconds into the match before Evans fought back and tied the bout with a takedown 51 seconds remaining in the period. No. 6 Logan Storley (Minnesota) dec. No. 3 Robert Kokesh (Nebraska), 6-4 tb2 — In a battle of former South Dakota high school rivals, the Gopher scored the deciding takedown on a double near the edge of the mat with just one second left in final tiebreaker … after the Husker enjoyed a 28-second riding time overtime advantage. In regulation, Storley scored on second period reversal while Kokesh benefitted from a pair of escapes. No. 2 Andrew Howe (Oklahoma) dec. No. 7 Tyler Wilps (Pittsburgh), 5-2 — The Sooner broke a 2-2 deadlock in the second period when he tallied a second takedown with 30 seconds left in that frame. In the third period, Howe scored on an escape for the final point. • A 2:03 riding time advantage gave Minnesota’s No. 6 Logan Storley a 5-4 victory over Virginia’s No. 11 Stephen Doty. • No. 1 Chris Perry of Oklahoma State scored a takedown in the closing seconds to give him a 11-3 major decision over Illinois’ Tony Dallago. • Four seeded wrestlers lost to unseeded wrestlers in this round. That included No. 8 Cody Walters (Ohio U.) losing to Northern Iowa’s Cody Caldwell, 9-6 tb; No. 13 Hayden Zillmer (Utah Valley) falling to Bloomsburg’s Mike Dessino, 8-6 in sudden victory; No. 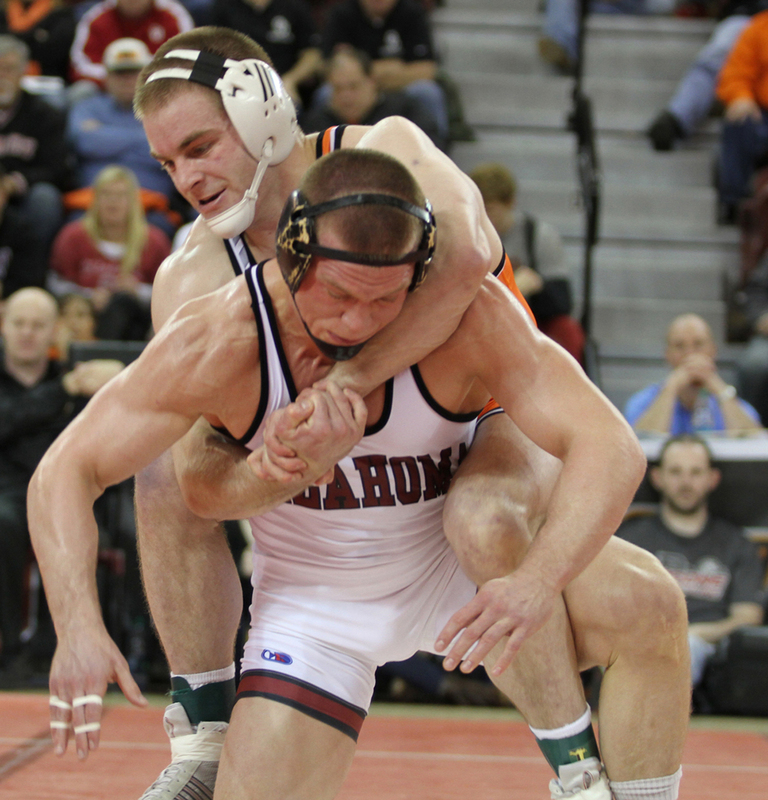 14 Mark Martin (Ohio State) losing to Rider’s Connor Brennan, 7-2; and No. 16 Matt Miller (Navy) losing 12-8 to Illinois’ Tony Dallago. Of those who scored the upsets, UNI’s Caldwell was trailing 5-3 and down by more than two minutes of riding time when the Panther scored an escape and takedown in the final 30 seconds to force overtime. All of his OT points came in the tiebreaker when put Walters on his back for a two-point NF, then added an escape. In a battle between former NCAA champions, Oklahoma State’s Chris Perry (top) avenged an earlier-season loss to Oklahoma’s Andrew Howe in the Big 12 championship bout. No weight class is tougher than 174 pounds, where seven All-Americans and two former champions — 2013 titlist Chris Perry of Oklahoma State and 2010 winner Andrew Howe of Oklahoma — return to battle in Oklahoma City. These two former champs split a pair of bouts this winter with Howe — whose three All-American honors came at Wisconsin before transferring to OU — winning in December and Perry avenging that loss in the Big 12 finals. If either of these two slip up, all five of the returning All-Americans could reach the top step of 2014 platform. Penn State’s Matt Brown ranks as the highest of the other returning stars after the Nittany Lion reached the 2013 finals before losing in a tiebreaker to Perry. This year, the junior is coming off a third-place finish at the Big Tens. Nebraska’s Robert Kokesh, a third-place finisher in 2013, recently won the Big Ten championship, where he defeated Iowa’s Michael Evans in the finals. The Hawkeye finished sixth in last year’s Nationals and is coming off a victory over Brown in the conference meet. Minnesota’s Logan Storley, a fourth-place NCAA finisher last March, should not be forgotten even though he settled for fourth in this year’s Big Tens. The Gopher, who also finished sixth in 2012, defeated Brown in a Feb. 9 dual which helped lead to a Minnesota victory. Meanwhile, Cody Walters, an eighth-place finisher at Ohio University, is coming off a MAC championship, but was limited to just 14 matches this winter. Looking to claim his first All-American honor is Pittsburgh’s Tyler Wilps, who is 28-5 after claiming an ACC championship.